Leyawiin is a Cyrodiilic city in the extreme southeast of the province, by the mouth of the Niben River where it opens into Topal Bay. 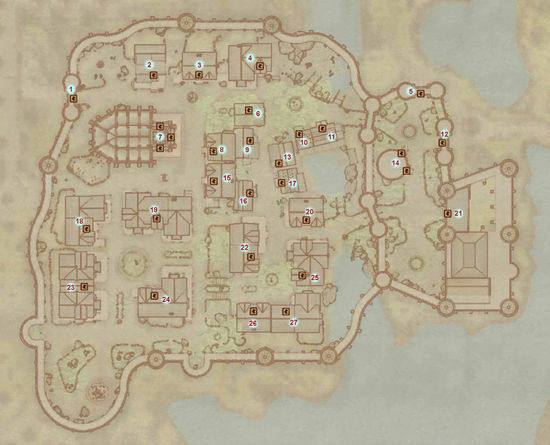 Located in the recently ceded Trans-Niben, a small strip of land between the provinces of Elsweyr and Black Marsh, it has a sizable population that includes many Khajiit and Argonians. Marius Caro is the Count of Leyawiin. Leyawiin straddles a swampy estuary of the Niben River. 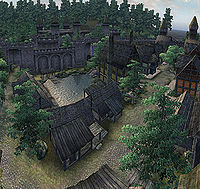 It is roughly divided into four districts: Chapel District, Guild Plaza, Main Street and Castle Leyawiin. ^aOnly appears during Sanguine's Quest. ^bOnly resides here on Sundas. ^cRelocate to Undertow Cavern upon completion of Drunk and Disorderly. ^dOnly appears here during Permanent Retirement. ^eDisappears after Raid on Greyland. ^fOnly appear here during The Hist. 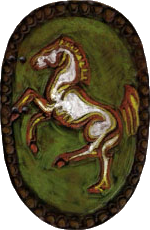 Knights of the White Stallion: Join this Knightly order by killing a notorious bandit. Tears of the Savior: S'drassa of the Leyawiin Mages Guild is looking for Garridan's Tears. Whom Gods Annoy: Rosentia Gallenus has been plagued by a foul smelling odor and some unusual house guests. Buying a house in Leyawiin: Purchase a house that perfectly matches its scruffy surroundings in Leyawiin. Leyawiin Recommendation: Help a mage regain her sanity to obtain a recommendation from Leyawiin. Sanguine Shrine quest: Crash a dinner party at Castle Leyawiin by playing a prank for Sanguine. Nocturnal Shrine quest: Recover the Eye of Nocturnal from a pair of thieves in Leyawiin. The Path of the RighteousKotN: Retrieve the Mace of Zenithar from the Chapel of Zenithar in Leyawiin. Permanent Retirement: Adamus Phillida spent years looking for the Brotherhood; assure him they've always been "right behind him." It is possible to climb over the walls and out the city. See this for details. This bug is fixed by version 3.5.0 of the Unofficial Oblivion Patch. This page was last modified on 5 August 2018, at 18:04.